Having no built-in floor, skep hives were placed on either rush mats or hardwood platforms to keep out the cold and the damp. In addition they were often tucked into purpose-made alcoves in stone walls known as bee-boles which kept off the worst of the weather. In winter, straw was stuffed around the sides for insulation and some bee-boles even had wooden doors which could be closed in foul weather. The molly-coddling of bees is nothing new! For their part the bees would line the skeps with propolis, a mixture of waterproof natural gums with fragrant antimicrobial properties. Then, as now, beekeepers were fixated with swarming but whereas we are intent on preventing swarming, the skep-beekeepers depended on their bees to swarm and indeed encouraged it by careful choice of the size of the skep – colder and wetter northern and western regions tending towards a smaller skep to ensure the necessary congestion to encourage early swarming: ‘Let your hives be rather too little than too greate, for such are hurtful to the increase and prosperity of Bees’. Swarming was further encouraged by careful choice of bees – the swarmier the better – with non-swarmers being eliminated. So it seems likely that the skep beekeepers are at least partly to blame for the unreasonably strong swarming instincts still found in some strains of bees. Throughout the summer, the beekeeper would catch and hive swarms in vacant skeps, then at the end of the season he would select the heaviest and the lightest of his stocks for the honey harvest – the reason being that the big ones had the most honey while the light ones would be on the weak side and unlikely to survive the winter. The honey harvest involved either plunging bees and skep into water to drown them or placing them over a hole in the ground containing either an arrangement of smouldering brimstone-impregnated papers or hot coals over which the beekeeper would sprinkle ‘flowers of sulphur’ at the appropriate moment in order to smother the bees. An alternative was to burn slices of dried puff ball (!) which would stupefy the bees. They could then be shaken out and the honeycombs removed. The remaining mid-weight hives were taken through the winter for the following year. This was skep beekeeping at its simplest and it was practised for centuries but then as now, beekeepers were fond of their bees and less destructive methods were sought. Not to mention the detrimental effects of plunging honeycombs into water or exposing them to sulphurous fumes! 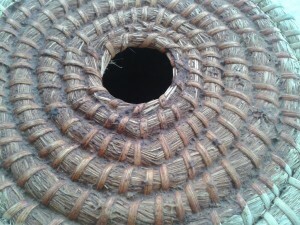 One such method was to ‘drive’ the bees from a full skep into an empty one. The full skep containing honey and bees was turned upside down – the domed top wedged into the top of an iron bucket or other suitably sturdy receptacle. An empty skep was then set at an angle to the open end of the upturned skep, in line with the direction of the combs, and fixed firmly in place with skewers called driving irons. The whole arrangement was then covered with a cloth and the sides of the full skep vigorously drummed. The theory was that the noise and vibration would drive the bees up out of the full skep and into the empty one leaving the combs of honey behind. The beekeeper could then either take some or all of the honey. If he chose to take only some then he could return the bees to their original skep and they stood a good chance of surviving the winter. Alternatively he could take the lot and unite the bees with another stock. Over the years, after much study and consideration, certain refinements in equipment evolved such as caps, supers, ekes and nadirs. In tandem with these came beekeeping systems. 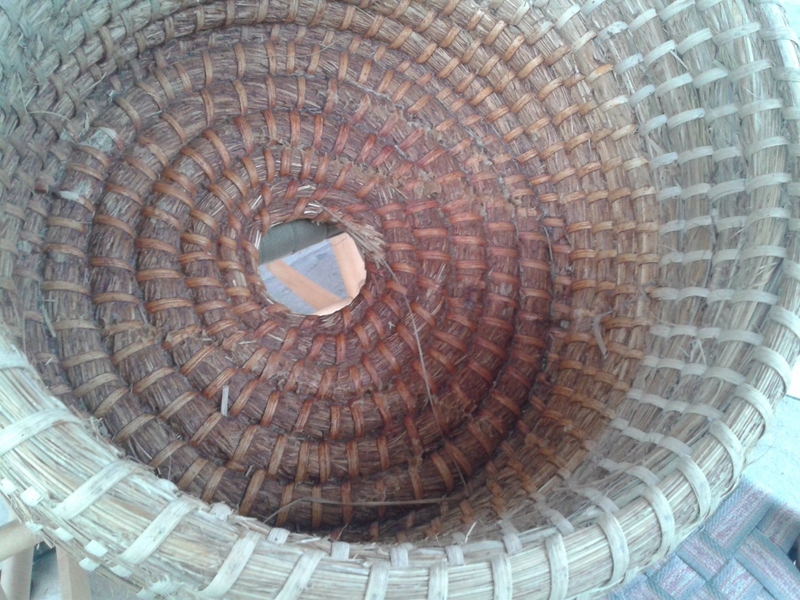 One system was to start a May swarm of bees in a large skep with an aperture in the top covered with a straw mat. When the bees had filled this, another similar skep with an open aperture was placed beneath – this was the nadir. Soon the flying bees would be hanging down through the aperture into the nadir where they would begin to draw comb. 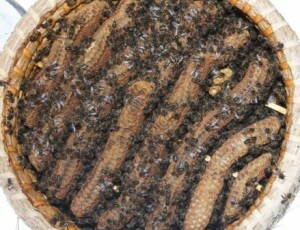 Eventually the queen would descend and begin to lay there while the top skep would fill with honey. If a strong flow persisted, the straw mat could be removed and a cap, a small skep without an aperture, could be put on the top. 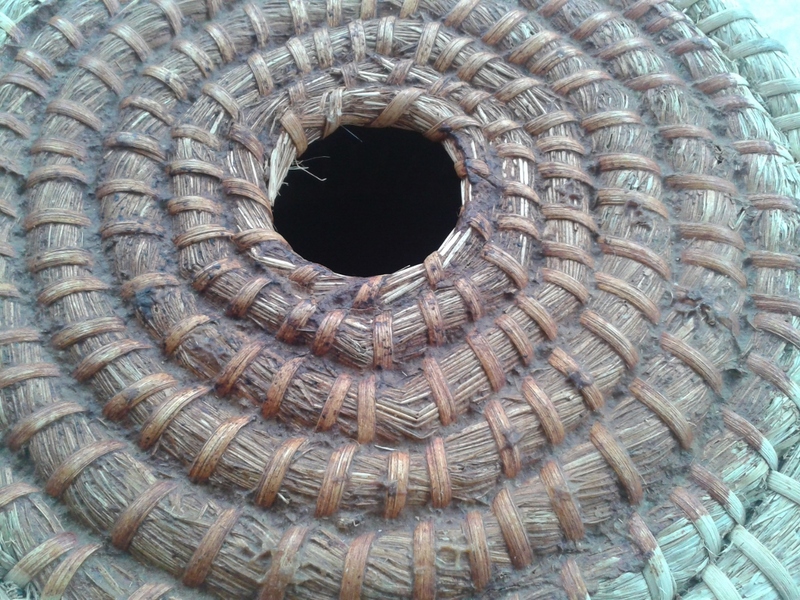 Another system was to start a May swarm as above but when the bees had the skep filled, an eke or ring of straw about four coils high was placed beneath to give more space for the bees to extend their brood comb while a cap was placed above the aperture over a piece of queen excluder. In the event of a strong flow, another skep with an aperture could be placed beneath the cap and over the excluder. All these additions could end in quite wobbly towers so each layer would have been held in place with a couple of strategically placed stitches. Given the length of time that beekeepers kept bees in skeps and their reluctance to change to the wooden hives, even given what seem to be obvious advantages of same, they must have had their successes. It would be an interesting experiment to put a swarm into a skep or skeps for the summer to try out one of the systems above. There’s a place in the garden where a weatherproof, if scruffy, bee bole can be easily constructed so all that is needed is to make a suitable skep or two and look out for a nice swarm of bees – if you find a nice big one in early May and don’t know what to do with it…. Copyright © Beespoke.info 2014. All Rights Reserved. Previous PostHoney with Gin InnitNext PostBee Basics – Which Feeder?